Own custom trade show displays or not own a custom display. That is the question. I recently attended a trade show where the majority of trade show displays looked pretty much the same. Most had a table with a generic table cover, at the front half of their space with staff either sitting or standing behind it. A few had a banner stand to the side and then a very basic display behind them which several were pipe and drape. Then the booth graphics were nothing more than a logo of the company somewhere on a solid color background. But then there were a couple of unbelievable custom trade show displays that completely set themselves apart from the rest of the displays. Have you ever seen these custom displays? Catch your attention? Of course. They stand apart from the rest of the trade show displays. Think it makes a difference? Absolutely! Those companies were the talk of the trade show floor and more than likely had more visitors engaging with the staff. Why custom trade show displays? Custom displays create that visual imapct at a trade show that draws everyone’s attention and attracts people to your booth. When you invest time and money into putting your company’s products, services and reputation on the line at trade show, you want to attract people to visit, ultimately to drive sales or generate leads. A trade show display that is custom designed makes sure that you’re putting out the BEST visual display to stand apart from the rest of businesses on the trade show floor. 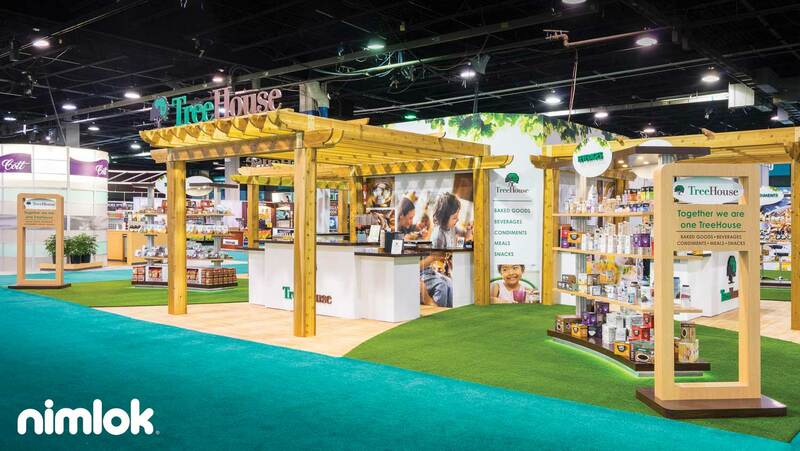 Besides being visually attractive, what other benefits of custom trade show displays are there? Well, in addition to the visual branding a custom display offers, there is also the reconfiguration ability. Case in point: Martin Engineering wanted an exhibit that could be reconfigured to meet their changing needs in size and function from show to show. From multiple size configurations depending on the trade show space, interchangeable graphics, moveable shelves and even optional monitor mounts allowed them to truly customize their trade show display every show. Being able to customize your trade show display size to meet the demands of multiple trade shows and the varying booth spaces while maintaining that unique branding look and feel is powerful. Having custom displays truly gives you the flexibility, freedom and creativity to attract a crowd and brand your company’s identity at a trade show. If you’re thinking about or are planning to get outside the box of an old school looking trade show display and need some help to weave your ideas, brand and business objective into eye catching presence, we offer free consultations to help you bring your custom trade show display ideas to life. I really like how you said that a trade show signs have visual impact and help to get people to come and look at your display. This is essentially the whole purpose of having a display after all is to get noticed and be able to explain things to people with questions. If you’re never seen then you can’t do what you love in helping people understand! !